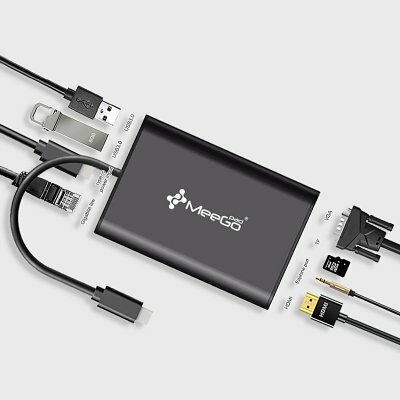 Successfully Added MeeGoPad USB Type-C Hub - HDMI, VGA, Ethernet, 2 USB 3.0, Micro SD, Audio, Type-C Power Delivery, MacBook Pro, Chromebook Pixel to your Shopping Cart. The MeeGoPad USB type-C hub is an all in one adapter for your MacBook Pro or Chromebook Pixel. With HDMI, VGA, Ethernet, 2 USB 3.0, Micro SD, 3.5mm audio, and Type C Power ports this is the only adapter you will ever need. The HDMI output supports 4Kx2K resolutions at up to 30fps so you can connect your computer to a 4K TV and enjoy Ultra HD content on a big screen. It is perfect for sharing movies from your MacBook or Chromebook Pixel as well as many other devices running on Windows 10, Os X Yosemite, Android or LINUX. Two USB 3.0 ports allow you to transfer data between devices and your computer at up to 5Gbps. Now copying large files from your phone or other devices is quick and easy. Backward compatible with USB 2.0 and USB 1.0 this compact hub is compatible with all your old memory pens. You will be able to charge your phone and peripherals through the USB ports and the Type-C power output means you can even charge newer devices like the iPhone 7 and other flagship phones. As this hub has plug and play all the USB ports are hot swappable. The addition and of RJ45 port makes it easy to connect your Type C device directly to a network using a LAN cable so you can enjoy fast internet connections when Wi-Fi or mobile data connections aren't available. Weighing a mere 91 grams this compact hub slips easily into your pocket or laptop case and brings you comprehensive connectivity for all the devices you'll need and more. This USB Type-C hub comes with 12 months warranty, brought to you by the leader in electronic devices as well as wholesale cool gadgets and tablet accessories.. Supported models: Macbook Pro 2016 & 2017, Macbook 2015 & 2016, Google Chromebook Pixel 2015, Lenovo Yoga 900 & 910, Dell XPS 13 & 15, HP Elite X2 1012, Microsoft 910, LG G5, Samsung S8, Huawei P9, Huawei Matebook 2, Mi Laptops and tablets MI5 MI6 Mobile, other TYPE-C3.1 devices, applicability:Laptop Tablet PC and TYPE-C Mobile Phone. It is a good product and it is good to use because it has various functions.